Given plain packaging of tobacco products will likely increase the tension many smokers experience, simple measures that enhance smokers’ access to cessation support, and affirm their decision to try and quit, could increase the number and success of quit attempts. This blog post details a just published study on this topic. It also suggests that New Zealand policy makers should ensure plain packaging regulations improve the current presentation of Quitline information and provide smokers with support to manage the dissonance plain packaging is likely to elicit. There is strong research evidence to suggest plain packaging will realise all of these objectives(1-5). Furthermore, now plain packaging has been in place in Australia for nearly two years, we have actual data on which to draw. Emerging evidence from Australia shows smoking prevalence post-plain packaging has fallen to the lowest recorded level. Irrespective of the measure used – daily smoking, age at which first cigarette smoked, or average number of cigarettes consumed by smokers – the data are clear. While more detailed analyses are required to estimate the role plain packaging has played in bringing about these changes, these data, together with evaluation studies (6), do not support tobacco industry arguments that plain packaging will have no effect on smoking prevalence. Early findings from Australia are important and should assuage concerns among NZ politicians that plain packaging’s effects are unknown. More importantly, this evidence suggests plain packaging is working exactly as predicted, and should galvanise the rapid introduction of this proportionate and effective policy. However, as well as moving rapidly to follow Australia’s lead, we should be asking whether and how we can improve on their legislation. Packages featuring a standard and unattractive colour, embellished only by large and off-putting pictorial health warnings, are likely to create considerable dissonance among smokers, many of whom would like to be smoke-free. Evidence from New Zealand and elsewhere shows the vast majority of smokers regret having started to smoke (7,8), and it is very difficult to find smokers who wish their children would also become smokers. Plain packaging presents an important opportunity to capitalise on this dissonance by stimulating quit attempts among smokers. 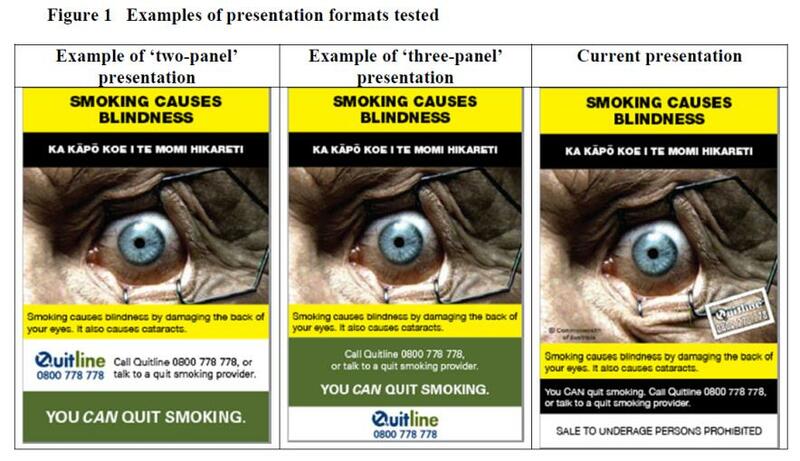 When pictorial warning labels, which also increased tension smokers experienced, were introduced into New Zealand in 2008, they incorporated the Quitline phone number as part of the large back-of-pack warning image. While research did explore the warning images and messages (9), the format of the Quitline information does not seem to have been examined as it lacks strong visual impact. Nevertheless, merely including simple Quitline details that explicitly directed smokers to cessation support had a marked effect on callers to the Quitline, many of whom reported that they had obtained the phone number from packaging (10-12). Perhaps more importantly, including Quitline information on tobacco packaging was an important step in supporting the many smokers who wish to quit. Denormalising smoking will help achieve the New Zealand Government’s goal of becoming an essentially Smokefree Nation by 2025, but measures that increase smokers’ dissonance without also increasing access to cessation support, risk creating feelings of alienation among smokers. Despite initial responses to the 2008 warning label changes, the Quitline details are arguably hidden in plain view and, now smokers have become accustomed to the warning images used, these labels may no longer capture attention as effectively. Because many quit attempts are unplanned, occur in response to environmental triggers (13), and are unsupported, measures that make cessation support better known and easier to access have the potential to greatly increase cessation rates (14). Moreover, enhanced access to cessation support should accompany measures such as plain packaging, which expose tobacco as toxic, and galvanise thoughts of quitting. Logically, providing simple access to cessation support, such as details of Quitline services, could capitalise on the dissonance created and direct smokers to assistance that will double the likelihood they quit successfully. Evidence that plain packaging represents a powerful cessation trigger is clear from Australia, where calls to the Australian Quitline increased markedly (and stayed at higher levels) following its introduction, even though the format of the information had not been improved (15). These findings suggest communicating on-pack Quitline information more effectively could achieve even greater increases in call volume, and may help bring about the large increases in cessation required to realise the 2025 goal. In a just published study, we recently explored the opportunity plain packaging presents by testing alternative pack designs that enhanced the salience of Quitline details, thus improving on Australia’s approach (16). A graphic artist designed new information panels to improve the size, contrast and impact of the warnings; Figure 1 below shows examples of the new designs and the status quo. We tested eight new designs that used either a “two panel” (as seen on the left) or “three panel” (which represents different combinations of two colours and one white panel, as seen in the middle) design and compared these to the current format. Respondents took part in a choice experiment, where they viewed showcards presenting balanced arrays of options and identified the one shown that they thought communicated the Quitline information most effectively. We analysed the data using a Scale-Adjusted Latent Class Model, and found respondents regarded all the test formats as more effective than the status quo. Of the new formats examined, respondents saw the two-panel formats as most effective (multi-nomial latent class estimates: Option 1, 0.86, 95%CI: 0.75 to 0.97; Option 2, 0.75, 95%CI: 0.64 to 0.86; status quo, −1.75, 95%CI: −1.90 to −1.60). Respondents also evaluated an image showing either the status quo back-of-pack design or a two-panel format; they evaluated the image according to its perceived legibility, visual salience and likely effect on them and on other smokers. Comparison of these evaluations showed respondents found the two-panel format significantly easier to read, more visually salient, and more likely than the control to encourage them and other smokers to consider quitting (see published paper for statistical details). In a final test, respondents viewed either the status quo or a two panel test image and clicked on each part of the pack they thought was likely to encourage smokers to think about quitting. The proportions clicking the Quitline number (28% vs 70%) or the affirming message panel (46% vs 91%) when shown in the test format were more than twice the responses to the control format. Clicks on the text headline and message were higher in the control than the test message; however, as the position, presentation and prominence of these elements were the same on both packs, these differences seem unlikely to diminish the overall impact of the test format. Figure 2 below shows the comparisons for each pack design. The results from all three comparisons are very clear and illustrate how plain packaging presents an opportunity to re-think all tobacco pack design elements so these actively direct smokers to cessation support. Reformatting Quitline information could easily make it more striking and increase its legibility; future work could extend this work by testing other measures, such as QR codes, which could take smokers directly to cessation enrolment sites and provide immediate access to support. There is now strong evidence that plain packaging of tobacco products assists with tobacco control. For NZ, such a new law provides an opportunity to enhance how Quitline messages are displayed on such packaging – our just published research provides guidance. New Zealand policy makers need to adopt measures that improve access to cessation assistance and support the (majority) of smokers who wish to quit. 1. Hoek J, Healey B, Gendall P, R E, Jaine R. How do adolescents perceive plain packaging? New Zealand Medical Journal 2013; 126(1383). 2. Hoek J, Gendall P, Gifford H, et al. Tobacco Branding, Plain Packaging, Pictorial Warnings, and Symbolic Consumption. Qualitative Health Research 2012; 22(5): 630-9. 3. Gendall P, Hoek J, Edwards R, McCool J. A cross-sectional analysis of how young adults perceive tobacco brands: implications for FCTC signatories. BMC Public Health 2012; 12(1): 796. 4. Hoek J, Wong C, Gendall P, Louviere J, Cong K. Effects of dissuasive packaging on young adult smokers. Tobacco Control 2011; 20(3): 183-8. 5. Gendall P, Hoek J, Thomson G, et al. Young adults’ interpretations of tobacco brands: implications for tobacco control. Nicotine Tob Res 2011; 13(10): 911-8. 6. Wakefield MA, Hayes L, Durkin S, Borland R. Introduction effects of the Australian plain packaging policy on adult smokers: a cross-sectional study. BMJ Open 2013; 3(7). 7. Fong GT, Hammond D, Laux F, Zanna M, Cummings K, Borland R. The near-universal experience of regret amoung smokers in four countries: Findings from the international Tobacco Control Policy Evaluation Survey. Nicotine and Tobacco Research 2004; 6(3): S341-S51. 8. Wilson N, Edwards R, Weerasekera D. High levels of smoker regret by ethnicity and socioeconomic status: national survey data. New Zealand Medical Journal 2009; 122(1292): 99-100. 9. BRC Marketing and Social Research. 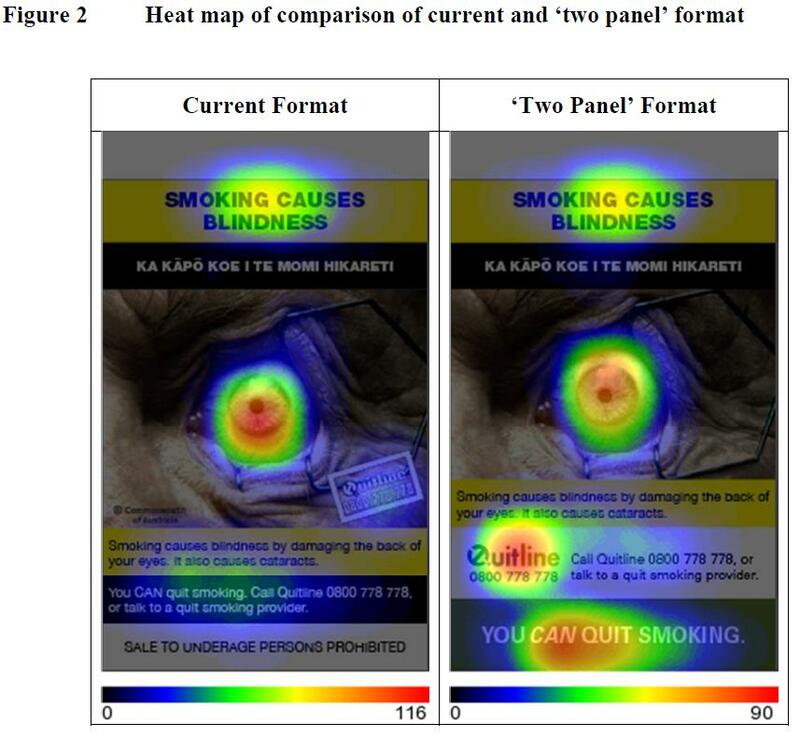 Smoking health warnings study: The effectiveness of different (pictorial) health warnings in helping people consider their smoking-related behaviour. Wellington: Ministry of Health, 2004. 10. Li J, Grigg M. New Zealand: new graphic warnings encourage registrations with the quitline. Tobacco Control 2009; 18(1): 72. 11. Wilson N, Li J, Hoek J, Edwards R, Peace J. Long-term benefit of increasing the prominence of a quitline number on cigarette packaging: 3 years of Quitline call data. New Zealand Medical Journal 2010; 123(109-11). 12. Wilson N, Weerasekera D, Hoek J, Li J, Edwards R. Increased smoker recognition of a national quitline number following introduction of improved pack warnings: ITC Project New Zealand. Nicotine & Tobacco Research 2010; 12(s 1): S72-S7. 13. West R, Sohal T. “Catastrophic” pathways to smoking cessation: findings from national survey. BMJ 2006; 332(7539): 458-60. 14. Thrasher JF, Osman A, Moodie C, et al. Promoting cessation resources through cigarette package warning labels: a longitudinal survey with adult smokers in Canada, Australia and Mexico. Tobacco Control 2014: tobaccocontrol-2014-051589. 15. Young JM, Stacey I, Dobbins TA, Dunlop S, Dessaix AL, Currow DC. Association between tobacco plain packaging and Quitline calls: a population-based, interrupted time-series analysis. The Medical Journal of Australia 2014; 200(1): 29-32. 16. Hoek J, Gendall P, Eckert C, Rolls K, Louviere J. A comparison of on-pack Quitline information formats. Tobacco Control 2014 (e-publication 31 October).